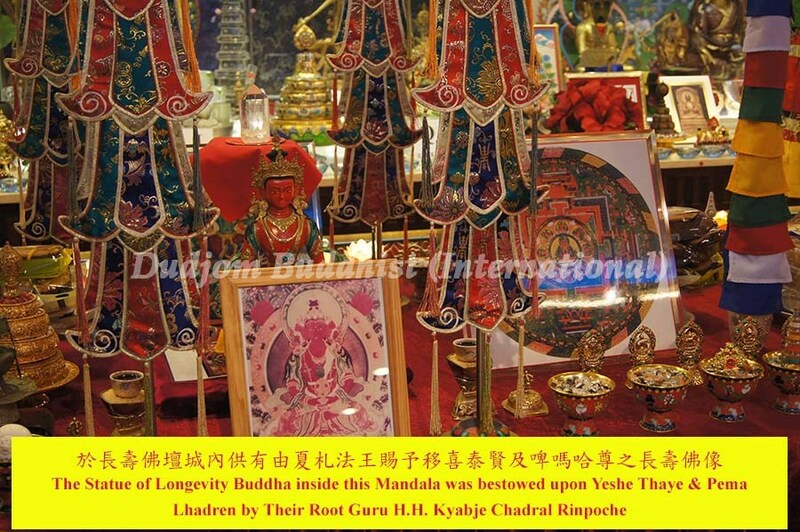 Vajra Master Pema Lhadren had followed the late Ven. Lama Sonam Chokyi Gyaltsan (alias Ven. 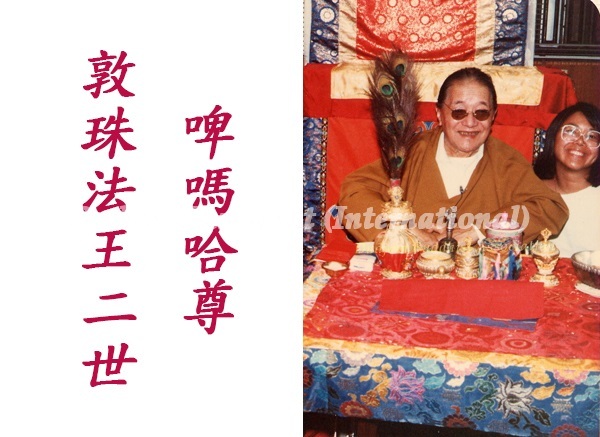 Guru Lau Yui Che) in practicing Vajrayana Buddhism for more than 20 years, and Guru Lau had personally conferred upon her the “Vajra Acharya Authority and Empowerment” (in Tibetan: རྡོ་རྗེ་སླ་དཔོན་, Dorje Lopön). 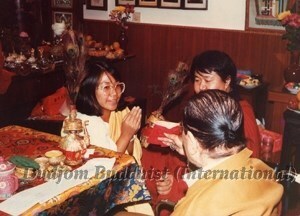 Meanwhile, back in 1981 and 1984, she had further received important teachings and empowerments of the “Dudjom Tersar Lineage” from the late His Holiness Kyabje Dudjom Jigdral Yeshe Dorje Rinpoche (the then Supreme Head of the Nyingma School of Tibetan Buddhism) on His second and third visits to Hong Kong respectively, and His Holiness Kyabje Dudjom Rinpoche had also bestowed upon her the Dharma name of “Pema Lhadren” (meaning the “Lamp of Lotus” or the “Heavenly Mother of Lotus”). After the late Ven. Lama Sonam Chokyi Gyaltsan (Ven. 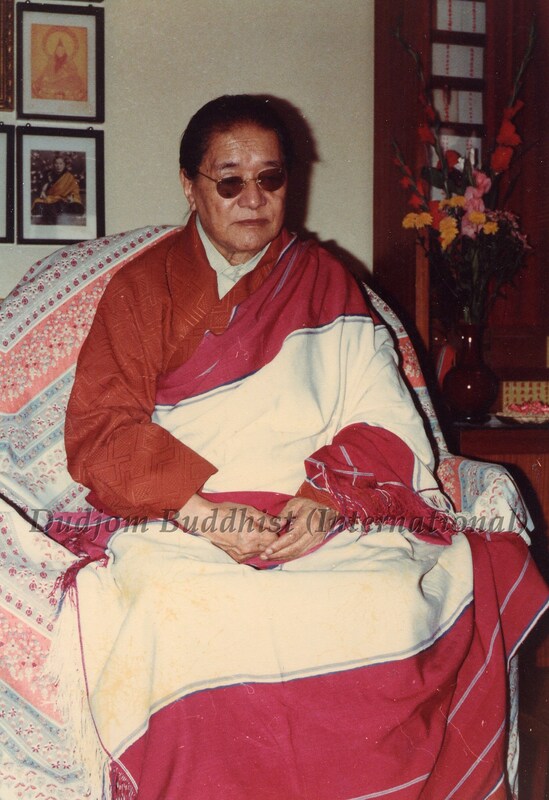 Guru Lau) had passed away in May of 1997, Vajra Master Yeshe Thaye with Pema Lhadren, went to Yangleshod (Pharping) in Nepal in September of 1997 to seek for the spiritual advice of the “Vajra Regent” (Dorje Gyaltsap) of the “Dudjom Tersar” Lineage, a Great Realized Dzogchen Master and foremost contemporary Mahasiddha, His Holiness Kyabje Chadral Sangye Dorje Rinpoche, the most respectable and world-renowned peerless Exemplary Elder of the Nyingma School of Tibetan Buddhism. His Holiness Kyabje Chadral Rinpoche had been most compassionate and kind to both Yeshe Thaye and Pema Lhadren, and had thus kindly accepted them as His Holiness’ own disciples. Furthermore, His Holiness Kyabje Chadral Rinpoche has been most kind in bestowing upon Vajra Master Pema Lhadren the Dharma robes. Later, His Holiness Kyabje Chadral Sangye Dorje Rinpoche was very happy to learn that Vajra Master Yeshe Thaye’s intention to confer upon Pema Lhadren with the title of the “Vajra Master” for both Lineages of the “Narak Dong-Truk” cycle and of the “Dudjom Tersar”. 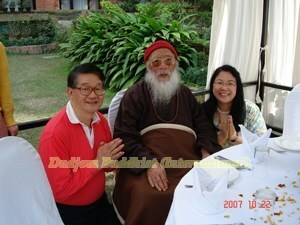 In this regard, His Holiness Kyabje Chadral Rinpoche had specifically sent a representative from Nepal on 2nd November 2010 to grant upon Vajra Master Pema Lhadren the following blessings : (1) a statue of the Longevity Buddha, (2) three precious volumes of writings that were written by His Holiness Kyabje Chadral Sangye Dorje Rinpoche Himself, and (3) a Buddhist stupa as the “Enthronement Blessings” on “ the Buddha’s Body, the Buddha’s Speech, and the Buddha’s Mind” respectively. Then, two weeks’ later, on 15th November 2010, His Holiness Kyabje Chadral Sangye Dorje Rinpoche further asked another messenger to bring along His Holiness’ presents of “one set of bell and vajra, one bottle of nectar pills, and many other blessed Dharma objects” as “Subsequent Blessings” to Vajra Master Pema Lhadren. 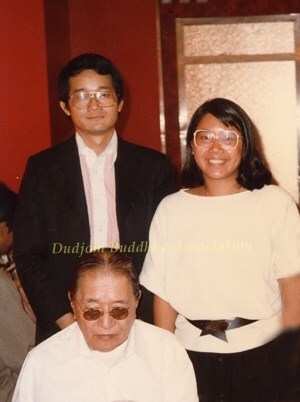 As the Co-Founder and Designated Main Instructor-in-Charge of the Dudjom Buddhist Association (International), Vajra Master Pema Lhadren is concurrently a Permanent Director of the Dudjom Buddhist Association (International). She has been committing and dedicating all of her efforts in spreading the Holy Dharma for the benefits of all our motherly sentient beings. In explaining Buddhist teachings, Vajra Master Pema Lhadren adopts a very unique and concise approach, which is in-depth and yet very easy to understand.Through this unique approach of exposition, Vajra Master Pema Lhadren makes structural analysis and logical deduction by using various accounts of actual experiences in real life, scientific analysis, different kinds of human behaviors, classic stories and quotes from the Lord Buddha’s teachings. 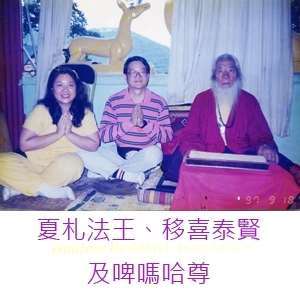 She translates the hard-to-understand Buddhist teachings into laymen concepts of everyday life experiences, in such a way that her unique and concise approach of explanations can be easily understood and instilled into people’s minds. Even for those who have some basic knowledge of Buddhism will be inspired by her insightful approach with a deeper level of understanding on the totality of Buddhism. Her most impressive explanations and teachings on actual Dharma practices include the following, namely: “Emptiness: Neither Existence Nor Voidness”, “Everything Comes From the Mind”, “The Inconceivable Law of Karma”,“the Freeing of Lives and The Law of Karma”, “The Importance of the Four Preliminaries (Ngondro)”, 7-lectures on “The Profound Abstruseness of Life and Death”, 13-episodes on the “ Course on the Practical Aspects of Sutrayana and Vajrayana”, 20-lectures on “The Essence of Tibetan Esoteric Dharma Practices”, 8-lectures on “The Fifty Stanzas of Guru Devotion”, and many other inspiring and enlightening teachings. 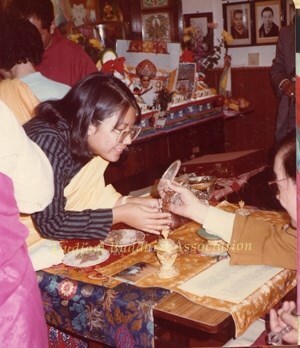 Moreover, in most of her teachings and lectures, the substances and contents touch upon the “most incisive details of actual Dharma practices”, which have never been explained so thoroughly and deeply by any predecessors before, thus demonstrating Vajra Master Pema Lhadren’s high level of standard in Dharma practice and wisdom prominently. 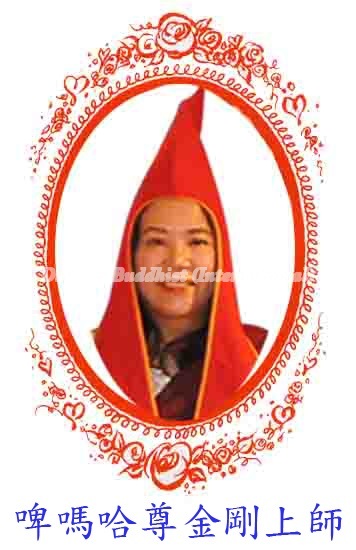 In addition, Vajra Master Pema Lhadren also possesses excellent leadership skills and innovative abilities. To facilitate her propagation of the Holy Dharma to the general public, she keeps on acquiring new knowledge through the continuous process of learning in such areas as computer knowledge, typesetting, video editing and production, database writing and application, word processing, and computer programming, etc., displaying her studious and tireless dedication to learn for the benefits of all our motherly sentient beings. Vajra Master Pema Lhadren’s writings, lectures, published multi-media CDs, books and magazines have now amounted to more than 350 types of teaching materials. 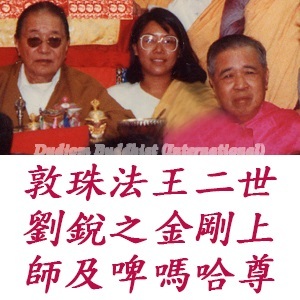 Being the Chief Editor of the English-Chinese bimonthly publication of the “Lake of Lotus”, Vajra Master Pema Lhadren has devoted not only to the wide propagation of the Buddhist teachings, but also attaches great importance to the purification of people’s minds and the elevation of their spiritual strength for the building up of a future harmonious society. 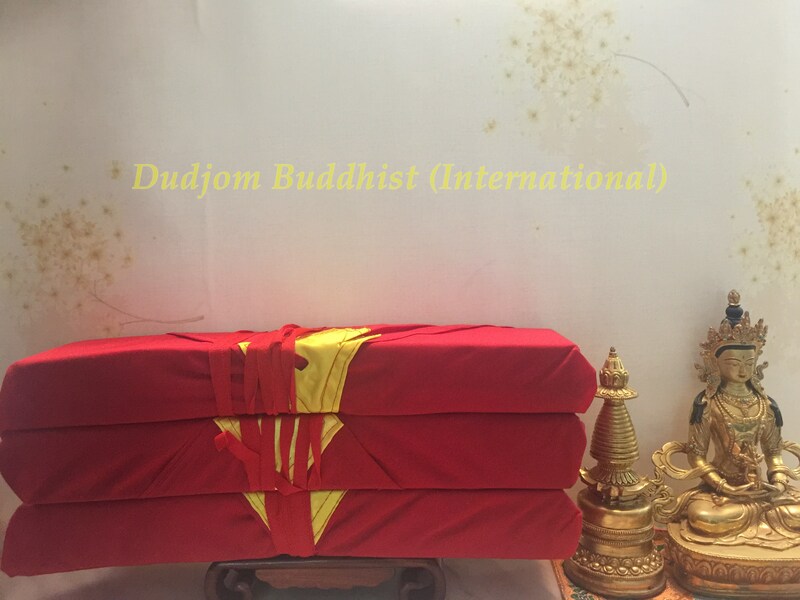 Welcome to Dudjom Buddhist Association International!